Motorola just announced (and then pulled) that their Moto 360 watch will be available in metal later today for a price of $299. They will offer two colors initially – dark and light metal – with a new champagne finish arriving in time for the holidays. They also announced new slim bands for those with smaller wrists or who simply want a different look. The slim band in light metal will run $299; the Champagne finish Moto 360 will run $329. Of course, you have already seen all of these, thanks to listings on Amazon that went up a week or so early. But, they are now official. Well almost, as soon as Motorola re-posts the announcement. Also in today’s news, Motorola announced new accessory bands that can be purchased separately in stone, black, or cognac leather, along with the dark and light metals. Plus, they have partnered with brands like DODOcase (stitched leather bands) and TYLT (silicone bands) to offer even more options. The announcement doesn’t say specifically, but I would imagine that these will be available today as well. On a watch face front, Motorola announced that an update to the Moto Connect app will introduce a new “My Design” watch face that allows you to customize everything from the background image to the style of the tick marks and watch hands. They also added the Design Face-Off winner’s watch face to the collection. Finally, Motorola is introducing Moto Body, a fitness-inspired experience that tracks your steps, distance, heart rate, and calories. Moto Body will also be available through the new Moto Connect app. As soon as everything goes live, we will be sure to let you know! 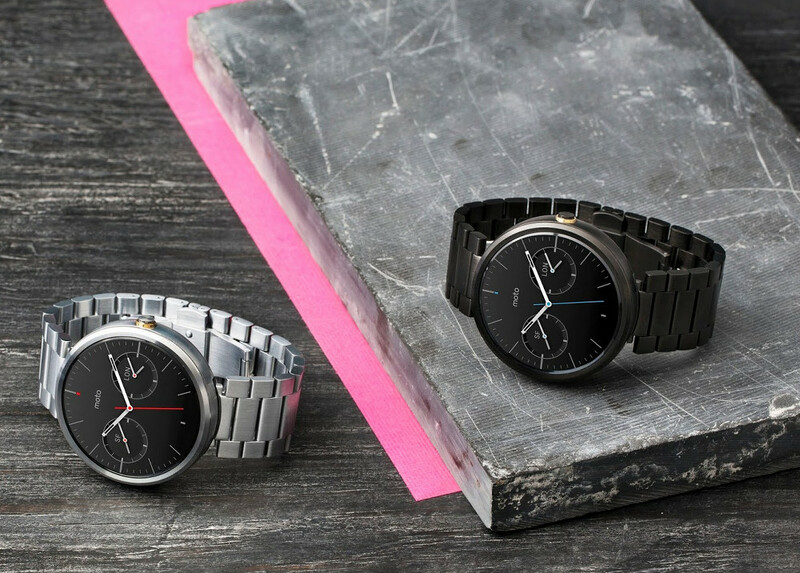 Update: The Moto 360 in metal is now available for purchase. Update 2: Motorola made their press release live again. We’re introducing more choice for Moto 360. From new metal additions to our watch offerings and a selection of interchangeable bands, to enhanced experiences that promote a healthier lifestyle, Moto 360 offers a diverse portfolio of modern timepieces. Moto 360 now comes with metal bands that are as durable as they are beautiful. Crafted from aircraft-grade stainless steel, these bands feature a modern, contemporary tri-link design that complements the round face of Moto 360. Starting today, Moto 360 with light and dark metal bands are available on motorola.com for $299. Coming soon, we will offer Moto 360 with new slim bands, which is an option for smaller wrists or people who want a different look. Slim bands will be available in time for the holidays in light metal ($299) and a brand new champagne gold finish ($329). Already have a Moto 360? We’ll offer interchangeable stone, black and cognac leather bands along with light and dark metals. Plus, we’ve partnered with some really cool brands through our M4DE program to bring you even more choices. DODOcase will offer stitched leather bands in four new colors. TYLT is working on colorful silicone bands to give you an entirely new look.